So like I’ve told you all before, we love hosting game nights. Well obviously since I love to cook, I usually whip up a bunch of appetizers to keep everyone satisfied all night. Well since the weather has finally turned, game night has turned into bon fires. This nice weather makes me think of summer and when I think of summer I think of my favorite dip, Spinach Dip. Well how about we take it a step further? 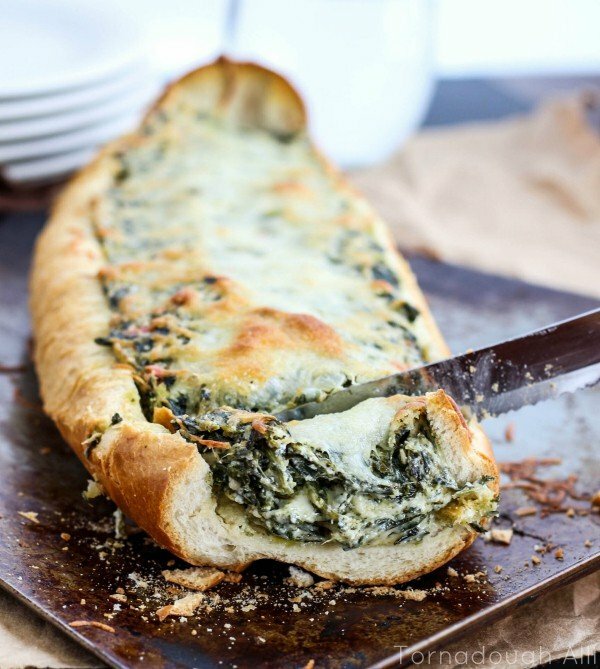 I give you Spinach Dip Stuffed French Bread. When I first saw this recipe over at Carlsbad Cravings I fell in love. It looked so creamy and delicious that I knew that I had to make it. We love stuffed french bread to begin with. Stuff it with one of my all time favorite dips and this gal is sold!! You’d be surprised at how quickly and easily this bad boy comes together! We love fast recipes don’t we! 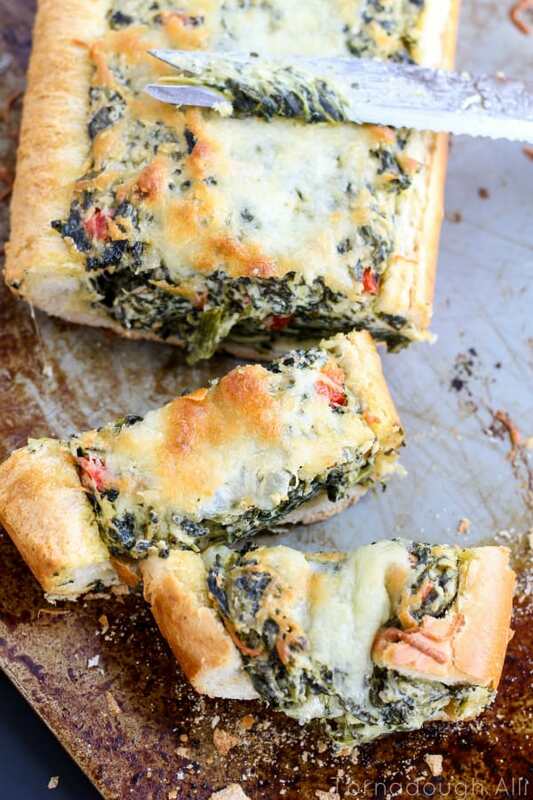 This is chalked full of creamy spinach, onions, peppers and a multitude of cheeses. Cheese get’s me every time. We are a big family full of cheese lovers. You tell my husband it has cheese in it and he’s sold, say no more. This went over so well at our bon fire that my friends could barely wait for me to post the recipe! 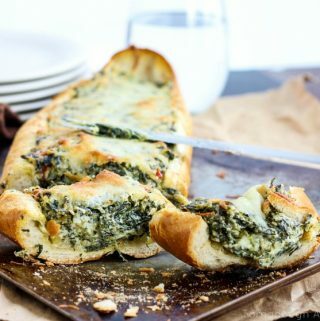 Well here it is, Spinach Dip Stuffed French Bread! Slice top portion of your French bread to creat a "bread boat" and set aside. Heat yourolive oil over medium high heat and onions and saute until soft then add red bell pepper and garlic and saute for a minute longer. Stir in your spinach, pesto, Worcestershire sauce, paprika, salt, pepper and mayonnaise until well combined. Reduce heat to low and stir in cream cheese until melted. Once melted stir in sour cream, parmesan cheese, 1/2 cup mozzarella cheese and montery jack cheese until combined. 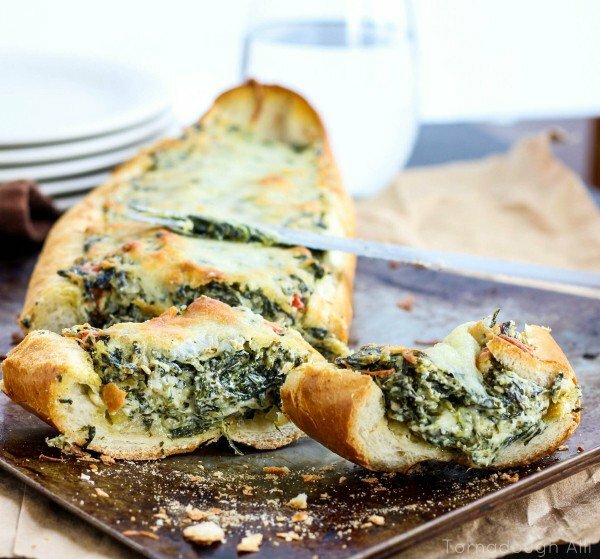 Spoon spinach dip into your French bread and top with remaining mozzarella cheese. Bake on a baking tray at 350 for 25 minutes or until cheese is melted and bread is golden. Oh my goodness! How good does that look?! And more portable to boot! This would be a perfect starter for our shrimp boil this year! I love spinach dip! I’ve had it with sourdough bread but have never thought to actually stuff it into bread. What a great idea! This looks so yummy I can’t wait to try it! Thanks for sharing! This looks so perfect for parties! I don’t even have to dip it – it’s already stuffed and ready for me to stuff my face with 🙂 Love how easy these are – such a cool idea too! I’m kind of angry that I’m not eating this RIGHT NOW. 🙂 It looks amazing! This looks so good and filling. I would just eat this for my meal. Yum. I could eat this all day everyday for any meal thats for sure. Ooooooh mannnnn… that looks like something I’d have a really hard time waiting for to cool enough to eat! YUM! You can’t go wrong with cheese and bread! I agree, cheese and bread are my all time weakness besides chocolate! Oh my! This looks so good. i could easily make a meal on this. 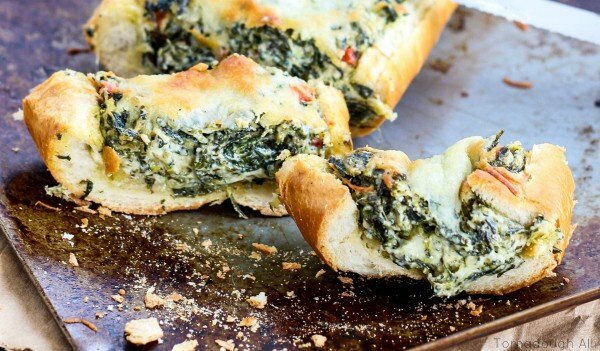 I love cheese and the spinach will make me think I am eating healthy! Thanks Cynthia!! This could be a whole meal for sure! Ah, there you go again! Gorgeous and so much better for serving! Great recipe, Alli! This looks so delicious! Thanks for sharing at The Pin Junkie Pin Party.